paris street, originally uploaded by jahansell. Sharon does not have a sister city. Apparently it's quite complicated to get one. There are a few other towns named Sharon (the one in Massachusetts is the closest) but I have no photos of them. Left to my own devices, I decided to choose my own sister city for this monthly theme posting. So why not choose the one that inspired this blog? It was my trip to Paris, and discovery of Eric's wonderful blog, that led me to create this one. And this photo, which I took in January 2005, is one of many I love from my two visits there. (A few others can be found at my long dormant blog of our trip, http://jandainparis.blogspot.com/. Meanwhile, if you want to visit the 148 (or so) other City Daily Photo blog postings from their sister cities, Click here to view thumbnails for all participants or use the list below. That's cool - Sharon gets to choose her sister! And that's a very nice picture of her!! 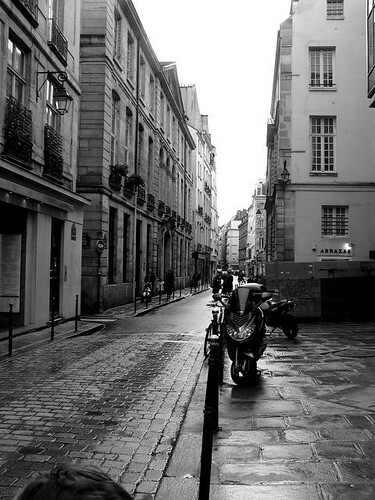 This is a typically Paris..good photo. What a smart idea! Wish I'd thought of it. It's a beautiful shot.These city sistrs have caused some problems today. Great idea to choose your own sister. I'm sure ondon would be happy to adopt you as well. This is an interesting post. I like it and also liked your post before it in black and white. Nice shots.